Warman Fuzzy Grandparents Day Photo Contest, hosted by Warman Home Care ~ http://www.warmanhomecare.com. Grandparents Day is this Sunday, September 8th, so the topic’s on my mind. Grandparents are a nostalgia-filled topic at our house because nobody here has any. Hubby and I both adored ours and would have loved for our daughter to have the same experience. I lost both my parents before I ever met my husband and we lost his last parent when Babykins was six months old. She doesn’t know what she’s missing, but WE do. We know what wonderful human beings our departed parents were. We know how many times we’ve had questions that can no longer be answered. That being said, we consider ourselves blessed with grandparenty types for our daughter. Seriously. Our cup runneth over with aunties, nanas, and surrogate grandparents. Our daughter gets to interact constantly with people older than us who love her. Some of them are friends, some are family, but all of them shower her with love and attention. I don’t know if she’d have had all those people step up if her grandparents were still alive to fill the role. I don’t know if her older cousins, great aunts and uncles would have worked as hard as they do to share her family history and traditions with her. It’s my job to teach you to live without me. She couldn’t possibly have known she’d die when I was only thirty-five. However, she was an oncology nurse who interacted with death on a daily basis and she knew that life is precious and time is fleeting. 1. Take a picture with all three of us. Pictures with multiple generations are precious. 2. Bake, anything at all. My love of baking comes from my mother and I hope to share it with my daughter someday soon. There are family recipes that only I know how to make. Since I only get this one child, if she hates the kitchen I’m going to have to enlist my brother’s children to pass on the secret of my Grandmother’s Almond Roca. 3. Walk in the garden. I’d give just about anything to stroll in my garden with my mother and my daughter (who’s named after her), planning the yard and smelling the flowers. My mama was a master gardener and I wish I’d asked her more questions. I’d love to walk on the beach with my mother, watching the waves lap against the shore. I live near the Pacific Ocean, so I have the ability combining this experience with a meal. But the real magic would be holding my mother’s hand and watching her play with her granddaughter. Here is a window into the fun that was my mother: The Almost X-Rated Garage Sale. One of my fave memories of my mother-in-law was teaching her to pump gas. Ideas on how to celebrate Grandparents Day. A website dedicated to grandparents. Do you plan to celebrate Grandparents Day this Sunday? What is your favorite memory of your own grandparents? 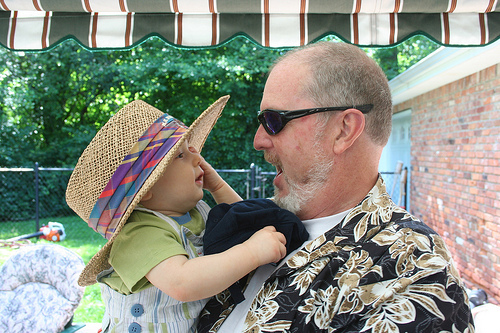 For the grandparents here, what is your favorite thing to do with your grandchildren? What traditions would you like to see carried on? Enquiring minds always want to know these things here at More Cowbell! This entry was posted in Parenting, Thoughty Thursday and tagged family, grandkids, Granparents Day, Jenny Hansen, memories. Bookmark the permalink. 23 Responses to Do You Celebrate Grandparents? Thanks so much, Lottie! And we feel very, VERY blessed. 🙂 But, like you, we still miss our parents dreadfully. I hope you’ll post a link to this again later today. I’m heading to bed in a few minutes and would love to check out your links. However…by the time I get up again, I’ll forget. A FB message would be even better, hint-hint because I’ll for sure see that. I’m sorry you lost your parents so young. I lost my dad to cancer ten years ago, but still have my mom. I haven’t had a grandparent in a long time, but EVERY memory of my mom’s parents is a good one. We did so many things together…including all the aunts, uncles, cousins…and Grandma and Grandpa, of course…renting three or four cabins for a week each summer (we were packed in like sardines at night cause they had 8 kids…and all the kids had anywhere from two to five of their own). Christmas Eve was one of the best though…and an evening my siblings and I looked forward to all year…cause we got to go to their house. My dad’s parents, on the other hand….I had no use for them. They were awful parents to their kids, so I don’t miss them at all. But I wish my kids could have known my maternal grandparents. And I wish my dad was still around for them (and me!). AWESOME sentiments, Jenny. Coming from the staid and non-demonstrative (no hugging!) two-baptism-dunks-removed-from-Mennonite background left little room for shenanigans with my grandparents. Mom and Dad had little patience for ill-disciplined children, and — to a person — all of my sisters broke the because-I-said-so rule of order. Besides — for Mom, at least — raising five girls filled her lifetime kiddo quotient. That may be one of the reasons all five of us dote on our grandchildren, and hope to create lasting, fun memories for them. My children may be “step” and were grown when I married their dad, but there is nothing “step” about my relationship and love for my grandchildren. I blinked! They grew up! And the video slayed me when I first heard it. I still listen to it periodically still. LOVE it. I adored my grandparents. My grandma was a fabulous baker. I think of her every time I measure flour. My elementary had us bring our grandparents in for a day in the fall, so much fun. Even with my busha and her babushka, I loved it. 🙂 I have some fabulous memories. I still have one grandparent around. He’s a feisty little man and my kids love him to pieces. My kids still have 4 grandparents, but both my FIL and dad are in the hospital right now. So, yes, life certainly is precious. Oh, Jenny I can feel the love oozing out of your words – for your mother!!! Your precious daughter will feel that and love her and learn about her through your words and actions and most definitely your heartfelt love. Glad she has many others in her life that are filling the void. I am constantly telling my teens how much their grandfather would have loved to have been here to see them and share in their new experiences. I talk about him all the time. We are fortunate to still have my mom and my husband’s parents living. I wasn’t even aware it was Grandparents Day. So obviously I don’t celebrate. I have clear memories of all my grandparents. One of my favorites is my Papaw Thornton teaching me to tie my shoes on a long car trip. I remember his sun-damanged hands over mine, showing me how to make the loops. That must have taken so much patience. I think I was in 5th grade the first time I heard about Grandparents day. I suspect my teacher may have been a grandmother herself because she gave us a project. “Write a letter to your grandparents for grandparents day and I’ll mail them off.” I think that was the first time I wrote to my grandparents. The cool part was that it made my grandma & granny’s (great grandma lived with my grandparents so I addressed the letter to all three of them) day and they wrote me back. We became pen pals during the school year after that. Because they lived a couple states away and only big businesses had internet access & long distance phone calls were too expensive for any long period of time, this was our way of keeping in touch. My grandparents & granny were great to me. They did their best to make up for the fact my dad (their son) wasn’t a big part of my life. I spent a few weeks every summer out by them starting when I was 12. It was awesome when my oldest cousin had her first child and we had 5 generations alive at the same time. That picture made the local papers. My mom’s parents died early, but when she remarried my stepdad, I inherited another set of grandparents. They were awesome, too. They passed away a few years back, but I have fantastic memories and stories locked in my head that make me smile when they choose to make an appearance in my nostalgic thoughts. Thanks! My grandparents were too old and staid by the time I came around but I try hard with my grandkids. I get down on the floor and play, chase them and have lots of fun. I read an article on modern grandparents and grandchildren. Seems it’s the grand kids who will take the time with us when we are too feeble to get around on our own–more so, than their parents, our own children. So to all of you, I’d say, cultivate the relationship. All you have to do, is play and laugh with them. In other words, show your love. 🙂 Kids are shy around any adult but if you’re willing to play and show interest in their little worlds, their hugs, kisses and trust are yours forever. The two grandparents I was closest two have both been gone for over a decade and I seem to miss them more each year, not less. But I like to think that they are still alive in their descendents. I know I have my grandmother’s love of purple and flowers and good cooking, and I even got some of my grandfather’s carpentry love. When my husband and I installed our hardwood floors, I thought constantly of Grandpa, reminded of his tools and his workshop and the lumber store he owned. I like the idea of doing something this weekend to remember them. I’ll have to see what I can come up with. I was very lucky to have 5 grandmothers. Yes, 5. Been a lot of divorce in my family over the years. All 5 of them were special and I have great memories of all of them. I don’t have birth parents or grandparents, I was adopted. The people who took me home brought me into a family that was close. My grandparent were of Polish descent. I didn’t speak English as a first language until around four. My Grandfather worked hard and owned the six-family he let his children rent apartments in. My grandmother was a roundish woman whom taught me how to cook. I had one extra a grand aunt. I’m a grand uncle. And not that old. Tom, it sounds like you were brought into an extraordinary family. And all I want to know is: Can you make perogis??! I had a friend who was going to teach me, then she moved and I never got the recipe or the tricks. Ditto on the cabbage rolls! Can do. Cabbage rolls on 9/8/13 @ http://www.tomwisk.wordpress.com Perogi will take a bit longer as I am kinda wavy on the dough., though Martha Stewart has the dough recipe. She’s a Polish girl who made good. Wonderful post Jenny. Thanks for posting this as my Grandma is 94 now and is the only one I have left. She is living with my parents down in Florida. I had many great aunts and uncles, as she had six siblings, and she is the last one left. I miss them all. Will send her flowers and head down to visit soon . Oh, Jenny, when I first read your blog posts about your mom, I was struck by what a special (and hilarious) person she must have been! So sorry your little gal never got to know her. For my guys, we’ve been lucky to have almost all of their grandparents, although my mother-in-law passed away when our youngest was only four. She was terrific, and I dedicated my first book to her. My parents are in failing health, so they don’t get to see their grandkids as often as they’d like, but we all have a great time when they do!